There were two disruptions on the East-West Line due to faulty track circuits in recent weeks. Commuters have asked if this is in any way related to the sleeper replacement project and what was the cause of it and what are we doing to rectify it? The track circuit faults are unrelated to the sleeper replacement project completed recently for the North-South and East-West Lines (NSEWL). The track circuit system is part of the signalling system, and is not part of the sleeper infrastructure that supports the running rails which trains travel on. Such track circuits are used to send signals to the operations control centre to monitor the speed, location and identity of trains passing the respective track signals. Track circuits are integral to the signalling system that is also ageing. When a track circuit fails, trains have to travel at a lower speed over the affected stretch for safety reasons. During peak hours, the need to slow down trains causes congestion along the train line because trains must slow down as they cross the faulty track circuit and cannot bypass the stretch of track. MRT trains must also maintain a safety distance between one another. This can result in trains stopping momentarily for several hundred metres behind the fault track circuit. There’s a knock-on effect on MRT stations too. As a result, platforms at MRT stations ahead of the faulty track circuit will get more congested during peak hours. While train services are still available, this is deemed a degraded mode of service. Ageing track circuits fail for two reasons. Firstly, a hardware failure of equipment at a Signal Equipment Room (SER) within a MRT station (that is, not on the actual track). Secondly, failures could occur at track side. For faults within a SER, there is a good chance that we can rectify the failure within a reasonable period of time. This is because the equipment is more easily accessible than trackside infrastructure, where access would involve clearance for track access and possibly the shutting of power or the use of trains as standing protection for the work teams. For trackside faults, engineering staff will have to access the track to investigate the root cause. This can be very challenging when the track is on a NSEWL viaduct, especially in the event of inclement weather and lightning risks. As a process, when rectifying track circuit faults, our engineering staff rule out a SER equipment malfunction first before proceeding to investigate trackside faults. That is why the failure of trackside equipment tends to take a longer time to recover. In the new signalling system that is currently being installed, the ageing track circuits will be replaced with a more advanced system that is more reliable as it is built with multiple redundancy for greater reliability. After we renew the signalling system, faulty track circuits will no longer cause prolonged delays for commuters. This is something we are looking forward to. We will start operating the new signalling system progressively on North-South Line. In time to come, after we have addressed the initial teething problems of the new signaling system, we will be able to improve the journey for commuters. Please bear with us in the meantime. SMRT is renewing the North-South and East-West Lines (NSEWL), Singapore’s oldest, longest and most heavily utilised MRT lines. The multi-year, multi-project efforts underline SMRT’s commitment to serve our commuters better. Last October, SMRT published Paving the Way for Better Journeys: Edition 2 to inform residents living along the North-South Line of our rail transformation efforts and benefits. These include smoother rides arising from sleeper replacement, shorter waiting times from new signalling systems, third rail replacement which boost network resilience and reliability, and higher train frequency as more trains are added into the network progressively. 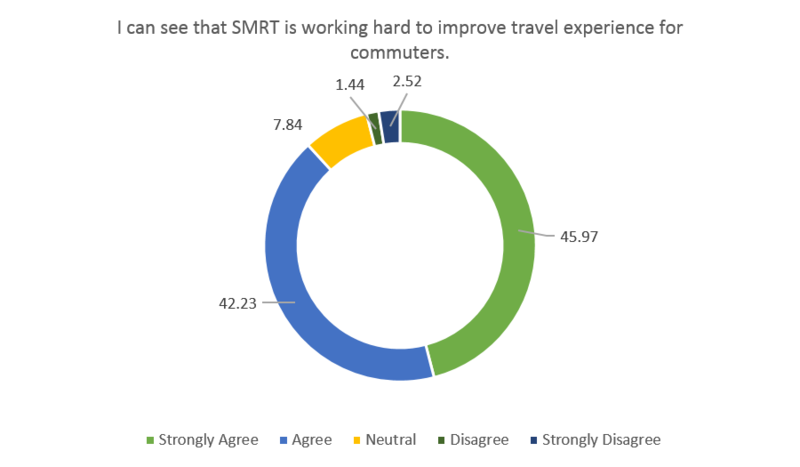 Nearly 90% of survey respondents could see the efforts SMRT put in to improve their travel experience. Thank you for your feedback and support. We take your comments seriously, and will continue our rail renewal efforts to provide you with better journeys. The following winners have won an exclusive stored-value card, and will receive an email from us shortly. 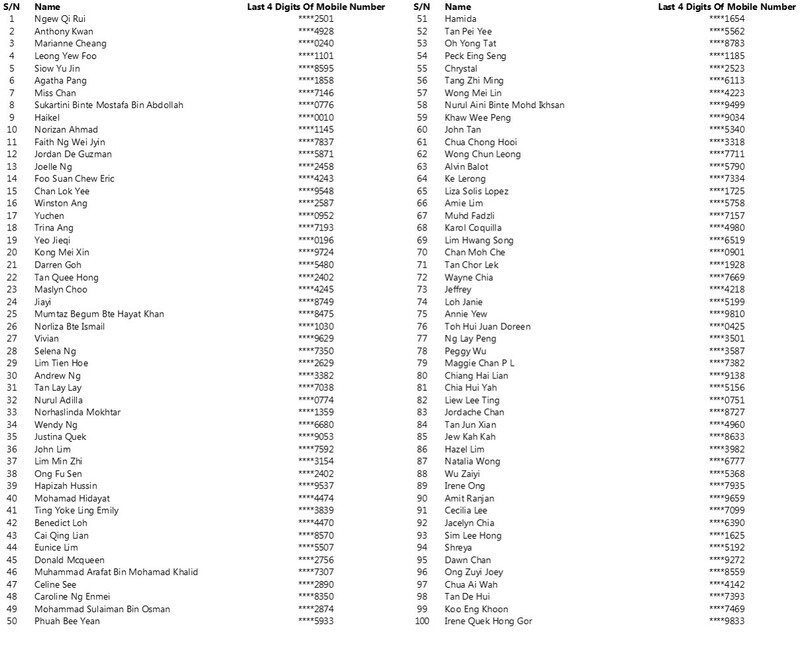 Please click on the image to view an enlarged version.